This Editorial Board Charter is a charter of an editorial board responsible for publishing a periodical printed mass medium, namely "Health Risk Analysis" journal (hereinafter called the Charter). The Charter fully conforms to the requirements set forth by the RF Federal Law "On Mass Media" passed on December 27, 1991 No. 2124-1. 1.2. The Charter determines organizational, economic, legal, and social grounds for the activities performed by the Mass Medium Editorial Board of "Health Risk Analysis" journal periodical printed edition and fixes the order of the interaction between the Founder of the mass medium and the Editorial Board in the process of creation, production and distribution of the mass medium product. "Health Risk Analysis" journal as a periodical printed mass medium does not belong to advertising mass media. 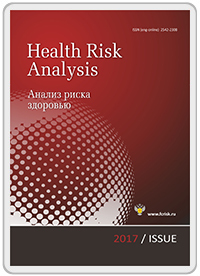 "Health Risk Analysis" journal periodical printed edition is registered as a mass medium by The Federal Service For Supervision Of Communications, Information Technology, and Mass Media (Roscomnadzor), Mass Medium Registration Certificate ПИ No. ФС 77-52552 issued on January 21, 2013. "Health Risk Analysis" journal periodical printed edition (hereinafter called the Mass Medium) was founded by Federal Scientific Center for Medical and Preventive Health Risk Management Technologies in the person of the Director Nina V. Zaitseva acting upon the Charter. The Founder and the Mass Medium Editorial Board (hereinafter called the Board) follow the Russian Federation legislation in their activities, notably, The Civil Code of the Russian Federation, the RF Federal Law "On Mass Media" passed on December 27, 1991 No. 2124-1, the RF Federal Law "On Advertising" passed on March 13, 2006 No. 38-FZ, the RF Federal Law "On the obligatory copy of the documents" passed on December 29, 1994 No. 77-FZ, as well as other regulations and this Charter. A representative of the Founder has the right to occupy any position in the Board team. The Mass Medium is issued by the Board. The Board is not a juridical person and independently acting economic entity. The Board operates under conditions of free mass information guaranteed by the Russian Federation Constitution on the basis of professional and creative independence. The Board does not depend on any political party and other social unions which pursue political goals. The Board operates in full conformity with the Russian Federation legislation and this Charter. The Board activities are funded by the Founder as per the procedure set forth by this Charter, the Founder Charter and other documents of the Founder. Should any obligations arise out of the Board activities, the Founder bears the responsibility, acts as a claimant and a respondent in the court and/or arbitration. Should the Founder be changed, all the rights and obligations of the Founder are to be passed to the legal successor. The full official denomination of the Board is "Health Risk Analysis" journal Editorial Board. The object of the Board activities is production and publication of the Mass Medium is conformity with the subject matters stated by the Founder at its registration as a mass medium. to perform any other activity which complies with the law and contributes into achieving major goals and solving major tasks, enriching material and technical resources and implementing collective social programs. The Founder fulfils his (her) rights in full conformity with the RF Federal Law "On Mass Media" passed on December 27, 1991 No. 2124-1 and the present Charter. to appoint on a position and to dismiss the Chief Editor and other staff of the Board. Staff are paid the salaries in conformity with staff list approved by the Founder. to pass over the right on the title of the Mass Medium or to change it. not to interfere in the professional activities of the Board except cases set forth by the legislation and the present Charter. when the Mass Medium contains information publishing of which contradicts the legal requirements and the present Charter. In these cases the Founder has the right on his (her) own accord to cease or to suspend the Mass Medium activities. Should the Founder be reorganized, his (her) rights are fully passed over onto his (her) legal successor. The change of the Founder is to be accomplished in the order set forth by the existing legislation of the Russian Federation. The Board is professionally independent in accomplishing its activities. The Board is headed by the Chief Editor (or his/her deputy on the written instruction of the Chief Editor) who fulfils his (her) rights in full conformity with the RF Federal Law "On Mass Media" passed on December 27, 1991 No. 2124-1 and the present Charter. The Chief Editor bears the full responsibility for observation of the requirements concerning a mass medium activity set forth by the RF Federal Law "On Mass Media" and other legal regulations existing in the RF. to observe the rules of publishing confidential information. organize their activities in full conformity with the existing legislation of the Russian Federation which fixes legal requirements to mass media. It is strictly prohibited to use the Mass Medium to commit public wrongs; to publish any information which contains state secrets or any other secrets protected by the law; to call for seizure of power, violent change of the constitutional system and the state integrity, fomentation of national, class, social, religious intolerance and hostility, and to publish war propaganda. The Boards is supervised by the Founder and the Chief Editor within their competence set forth by the present Charter, the Charter, and other acts of the Founder. allocates necessary funds for production and publication of the Mass Medium and approves the Board budget. The Chief Editor is responsible for daily activities of the Board. The Chief Editor accomplishes his or her activities in full conformity with the legislation of the Russian Federation, the Charter and other acts of the Founder, labor contract, Contract with the Chief Editor, and the present Charter. The Chief Editor bears the full responsibility for observing requirements to the Boards activities and journalists activities set forth by the legislation of the Russian Federation and the present Charter. The Chief Editor is appointed at the post and released from it on the basis of the order issued by the Founder. The Chief Editor is recruited without any certain date of labor contract expiration except the cases in which conclusion of a fixed-term contract is allowed in accordance with the Labor Code of the Russian Federation. The Chief Editor within his or her competence runs the Board on the basis of undivided authority and solves all the issues in the Boards activities on his or her own, except such issues which are within the competence of the Founder management. bears the full responsibility for observing requirements to the Mass Medium activities set forth by the RF law "On Mass Medium" and other legislative acts of the Russian Federation. The Chief Editor enjoys the rights and fulfils the obligations in full conformity with the present Charter. The Chief Editor has the right to appoint the Editorial Council having approved the provision on it. All the decisions taken by the Editorial Council are of voluntary character. The members of the Editorial Council are appointed or excluded from it on a voluntary basis provided that the Chief Editor has granted his or her written consent on such actions. The Chief Editor is a member of the Editorial Council on the basis of his or her position. The Editorial Council is summoned by the Chief Editor as required to discuss issues concerning production and publication of the Mass Medium. The Chief Editor is to be present at any meeting of the Editorial Council. The Editorial Council is not entitled to discuss and take decisions concerning issues which are attributed to the competence of the Founder management by the provisions of the present Charter. The editorial staff are all the employees that have concluded labor contracts with the Founder and are responsible for editing (literary, scientific, or technical one), collection, and preparation of texts and illustrations for the Mass Medium. The editorial staff take part in development and preparation of editorial plans, and in activities, performed by the Editorial Board; put forwards suggestions to the Editorial Board supervisors on how to improve the Mass Medium quality and to make editing and issuing processes faster. The editorial staff adopt the Editorial Board Charter which consequently is to be approved by the Founder. The editorial staff fulfill their rights at the General Meeting (of the editorial staff). All the disputable questions are to be discussed and decisions related to them are to be made by voting. To make a decision, a simple majority is required. A decision made by the editorial staff is considered to be valid only if it was made at a meeting with the number of participants being at least ¾ of the overall number of the editorial staff. The editorial staff as a whole and each employee have the rights and carry the responsibilities fixed in the RF labor legislation and the present Charter. treat the property belonging to the Editorial Board and the Founder with proper care. The publication of the Mass Medium can be ceased or suspended only by the decision of the Founder or by the court in the civil justice process as per any claim presented to the court by a registering authority. the production and publication of the Mass Medium are considered to be inexpedient by the Founder as per any other reasons. The decision on cessation or suspension of the Mass Medium activity is taken by the Founder after consultations with the Board management. Should the Founder take a decision to cease the publication of the Mass Medium, the Founder preserves the right to resume the publication of the Mass Medium under the same title. Should the Founder take a decision to cease the publication of the Mass Medium, the certificate of its registration and the present Charter become invalid. The Board is to be eliminated in such case. Should the Founder violate the present Charter, the Board has the right to put the matter in the face of the Founder. The right on the title of the Mass Medium belongs to the Founder. Should the preparation and publication of the Mass Medium be ceased, the right to resume the publication of the Mass Medium under the same title is preserved by the Founder. Should the Founder be changed, or should any changes in the composition of the founders occur, the Board continue their activity after re-registering in the order fixed by the law. Should the Founder be reorganized, the rights and obligations of the Founder are to be fully assigned to the legal successor. Should the Founder be liquidated, the Mass Medium activities are to be ceased. The Board activities can be ceased or suspended only by the decision of the Founder or the court. The cessation of the Mass Medium activities entails the invalidity of the registration certificate and the Board Charter. Reorganization of the Board in any form fixed by the legislation of the Russian Federation, changes in its legal form do not give any grounds for the cessation of production and publication of the Mass Medium provided that the Founder did not decide otherwise. Should the Board be liquidated, the publication of the Mass Medium is to be ceased. The Board Charter is passed on the meeting of the total Board journalists team and approved by the Founder. Alterations and addenda into the Board Charter are made by the Founder on the own initiative and by the suggestions of the Board. Any alterations and addenda concerning the rights of the journalists team are made only after they have been approved by the meeting of the journalists team; any alterations and addenda concerning the state of the Board, relations between the Board and the Founder, and management of the Board are to be made with the Founder consent. Should the Founder take a decision to cease the Mass medium activities, the present Charter becomes no longer valid. Legal relationships which are not regulated by the present Charter are to be regulated in full conformity with the legislation of the Russian Federation. The present Charter comes into force form the moment of its approval by the Founder.